One of the advantages of Windows users is to be able to access functions that will later reach the general public thanks to the Insider Program. With several rings, the most risky but also the one that offers more novelties is the Skyp Ahead ring, which already offers access to Builds with flavor to Redstone 5 . A very exclusive ring that however was not available to Xbox One users, who had to settle for the “basic” rings we all know. And it was not until now, since Microsoft have announced the availability of the Skip Ahead ring and thus test the news that will come with Redstone 5 . 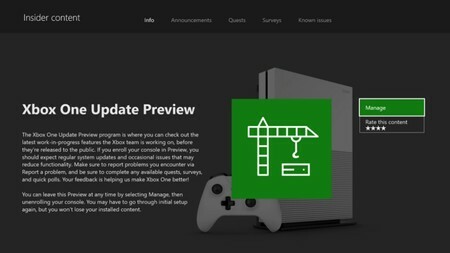 Also known as “Alpha” ring, the option of being able to access Skip Ahead will be possible over the next few weeks for those who already integrate the same ring in Windows 10 and will arrive later on invitation through the users of the Xbox Insiders program. already participate in other rings. In this way users who are in this ring will have access to the compilations that are released to test and test the functions that will arrive with Redstone 5 and later reach the general public. Of course, we must bear in mind that being in development is a more unstable system that may contain malfunctions. It is important therefore that values, in case you are interested and have an invitation, if it is interesting to face this risk, especially if you make intensive use of your Xbox One console. If you are concerned about stability problems and you are already in Xbox Insiders, you can stay in your ring and reject the invitation . Also, even if you enter Skip Ahead, you can leave when you’re interested.